Product prices and availability are accurate as of 2019-04-24 08:02:45 UTC and are subject to change. Any price and availability information displayed on http://www.amazon.com/ at the time of purchase will apply to the purchase of this product. Presenting Bandai's Action Base, created to hold kits from Bandai's SD Gundam, 1/144 scale models, HGUC, HG Gundam Seed, 1/100 scale models, MG, and Real Robotic Transformation series! No other screen bases from other companies come close what this fantastic screen base enables you to do! The Action Base is a plastic injection snap-fit assembly kit that needs very little work to put together. No cement or paint needed! The octagon base and the square part that can be connected to any one of its sides have cool mechanical detailing and panel lines, plus a total of 10 holes for positioning the support pole for the major stand to adjust the major stand's height. The support pole has an inventive locking mechanism that enables it to extend or retract and is strong enough to hold the major stand in place. The major stand itself can likewise be extended upwards to posture your kit in a much higher position. The set comes with 3 various sizes (8mm, 9mm, and 11mm) of U-shaped holders, peg-type holders, and screw-on type holders (2 screws and a nut are consisted of) for connecting the major stand to the crotch of the kit. When using the U-shaped or screw-on holders, double-sided tape (small quantity consisted of) need to be applied between the crotch of the kit and the holders to hold it in place. A name plate is consisted of that can be connected to any one of the holes on the base. 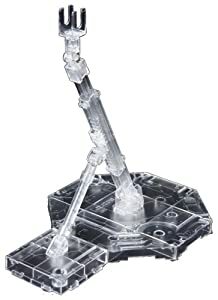 Each Action Base 1 can be connected to up to 6 other Action Base 1sts for you to develop an incredible screen filled with Gundam/robot kits striking cool action positions! Check out the other color variations, connected below!